Details at the end of this review on how to win a copy of Wakeworld. In this book, Vivian is trying to hold things together and be with the man she loves, painter and dragon killer Zee, but the dragon inside her is trying to break free and she is afraid how Zee will react when he finds out. As a dreamshifter, Vivian is the last line of defense between reality and the dream world, and she believes she is the only one left of her kind. A strange old woman bumps into her and steals her protective amulet, and this begins an adventure that could cost her Zee and her life. Wakeworld introduces a new character, Weston Jennings, who is also a dreamshifter and believes he is the only one of his kind. He fears his powers as a dreamshifter, and resists learning to control them. After suffering a tragic loss, Weston heads deep into the woods of the Pacific Northwest to embrace a safe life of solitude. But when a terrible mistake leads to an innocent’s death, his guilt drives him to his former home, where he encounters what he never thought he would find: another shifter. With her amulet missing, Vivian can no longer enter the Dreamworld. She learns about Weston and hopes to get his help in getting back in the Dreamworld to retrieve it and save Zee, who ends up stuck over there facing his own demons in his quest to help Vivian. The plot is very complicated and I don’t want to give anything else away, but this book is filled with fantasy, adventure, dragons, magic and much more. The characters are great and well developed, and I love Vivian’s ever present Penguin pal Poe. You really have to read the first book first, or you will be completely lost. This is one of the most complicated settings for a book I’ve ever read, and it is so well done. Kerry’s writing brings the whole thing to life. I can’t wait for the next book. 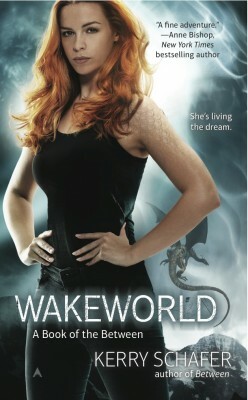 I highly recommend grabbing a copy of Between and Wakeworld! Binge reading is a trend right now, so why not grab yourself a copy of these two books and binge! To enter to win a copy of Wakeworld, simply email KRL at krlcontests@gmail[dot]com by replacing the [dot] with a period, and with the subject line “Wake,” or comment on this article. A winner will be chosen March 1, 2014. U.S. residents only. Thank you so much for the lovely review! It’s a pleasure to be back here with my second book. So glad you liked the review! Can’t wait for the next one. Liliana – I do hope you enjoy! Would love to hear back from you if you do decide to read. Thanks for the great review. I loved Kerry’s first book, Between, and can’t wait to read Wakeworld. Stephanie – hi!! (waves) Thank you so much!